Special Containment Procedures: An exclusion zone has been established around the circumference of SCP-185-FR's zone of effect. 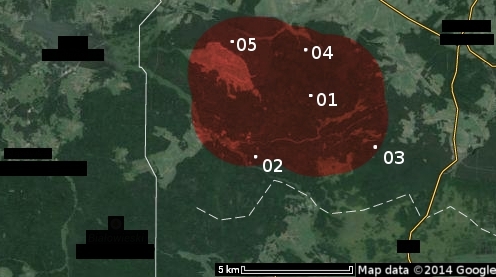 The radius of the exclusion zone should be 5 km greater than the radius of the zone of effect. Public access to the exclusion zone is to be officially forbidden under the pretext of contamination caused by illegal dumping of radioactive waste. Once every three months, surveillance teams may deposit mildly radioactive substances within the exclusion zone and outside the zone of effect as necessary to maintain this cover. The exclusion zone should be kept under constant surveillance. Observation of SCP-185-FR instances should take place via high-magnification cameras installed around the zone of effect. At this time, only SCP-185-FR-02 and SCP-185-FR-03 are being monitored in this manner. This surveillance ring should be redrawn as necessary to stay around the perimeter of the zone of effect as it expands. Areas affected by SCP-185-FR are to be demarcated and patrolled daily using two (2) disarmed VAB Mk3 RDT transports. However, flyovers in these areas are prohibited. Surveillance teams shall consist of twenty-five members armed by the Department of Security and clad in military uniforms. These teams are to be rotated every three months, and will be based out of a mobile bunker, which will serve as their command center. If the growth of the zone of effect puts the command center within the new exclusion zone, it should be moved to a suitable location outside the exclusion zone. In the case of a potential reflux, surveillance teams must evacuate any human and animal corpses. Animals or humans caught in the zone of effect should not be recovered. Potential witnesses of a capture event are to be administered Class C amnestics and given hypnotherapy to implant false memories of attacks by wildlife, accidents, or any other scenario that could plausibly cause the death or disappearance of SCP-185-FR's victims. Description: SCP-185-FR is a cluster of anomalies present in the ██████████ Forest on the border between Poland and Belarus. This group is presently comprised of five instances designated SCP-185-FR-01 through SCP-185-FR-05. Each instance differs slightly from every other in its physical form, though not in its anomalous effects. 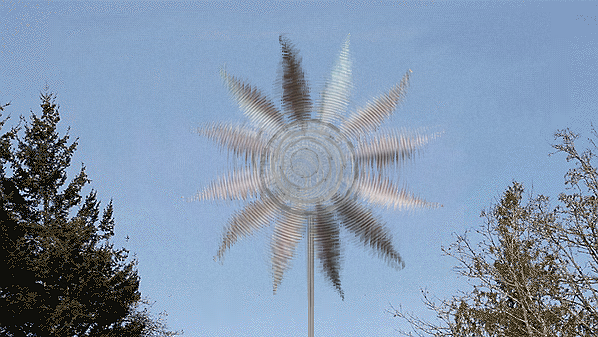 Overall, instances of SCP-185-FR appear as pole-like metallic structures supporting an animated assembly that vaguely resembles a stylized sun. Their height ranges from six (6) to fourteen (14) meters, while their diameter ranges from three (3) to five (5) meters. Collecting samples of the material composition of these instances is precluded by the effect of SCP-185-FR, which renders any approach physically impossible. SCP-185-FR's area of effect varies between thirty (30) and fifty (50) meters each. Since the manifestation of SCP-185-FR-03, SCP-185-FR's area of effect covers seven and a half (7.5) square kilometers, partially delimited by the five (5) instances. This area of effect fluctuates in unpredictable ways between the instances, with variations able to reach up to one-hundred and fifty (150) meters. The duration between the fluctuations can vary from several hours to several days. Any and all forms of movement are impossible inside SCP-185-FR's area of effect, except by SCP-185-FR instances themselves. All manner of kinetic energy is nullified inside SCP-185-FR's area of effect: any object or lifeform caught within the zone during a fluctuation event is instantly frozen in place. In spite of this, gravitational forces still work within the zone, affecting objects and lifeforms alike. As such, a ball thrown into the zone during a fluctuation event will abruptly halt and fall to the ground. Due to the absence of kinetic forces, it is impossible to retrieve lifeforms trapped within the zone. Lifeforms trapped inside do not appear to decompose, even if they are deceased. During a fluctuation event, the zone's event horizon appears as a vibrating invisible wall, and becomes impossible to traverse. The only movements to have been detected within the zone is that of the various instances of SCP-185-FR. Since the appearance of SCP-185-FR-03, the area of effect has increased in an irregular manner with each new instance. Even though the time lapse between each new manifestation grows longer with each event, each new manifestation has corresponded with a significant expansion of SCP-185-FR's area of effect. Researchers estimate that by 2019 the zone will have reached the town of ████████, and that it will have been partially or completely trapped within the anomalous area of effect by 2025. More precise simulations are made difficult due to the irregularity of the zone itself. However, what is certain is that, given enough time, the effect will grow to encompass the entire world. Map of SCP-185-FR's area of effect on 30/09/2014.